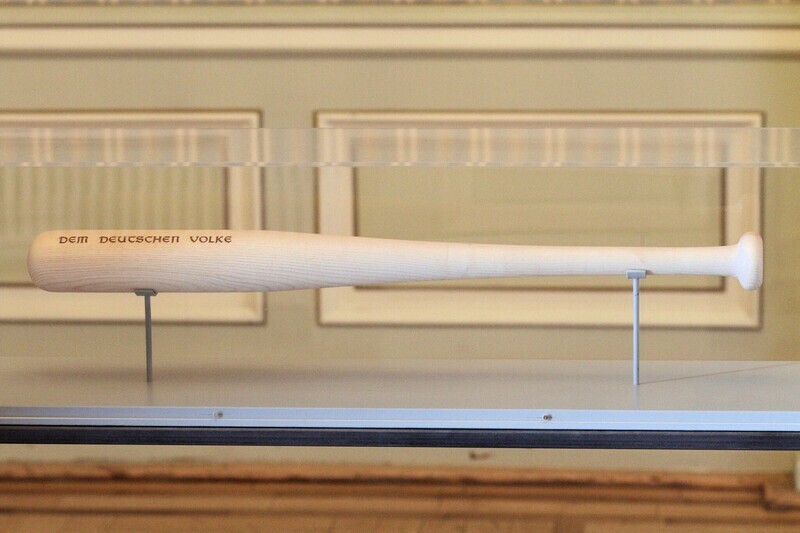 The baseball bat is closely associated with violence from the extreme right-wing. On this object Miro Kaygalak inscribes the three words from the facade of the German Parliament: Dem Deutschen Volke (To the German People). Controversy about the well-known inscription on the German Reichstag existed from the very beginning: although it was part of the designs by the building’s architect, Paul Wallot, the architrave above the portal remained empty for 20 years, in order to avoid emphasizing sovereignty of the people too much. It wasn’t until 1915 declining support for the Emperor among the populace caused the completion, and the lettering was finally made from the molten metal of two canons captured from France. Miro Kaygalak, born in 1972 in Bingöl, is based in Berlin and the founder of Artlabel Errorist. Errorist believes that »You are right if you are wrong«: As an art project, it uses this antinomy to reproduce itself. As a political instrument Errorist scans the constitutive contradictions of social systems in order to illuminate their organizing principles via internal disruption.